African American gospel music seems without obvious parallel as a musical and social phenomenon of the twentieth century. It is a powerful musical and ‘spiritual’ expression that is to a larger extent defined by the musical style, vocal techniques and performance practices of one of it’s central figures; the gospel singer. Although these originally African American gospel vocal techniques and practices have now also significantly influenced the development of contemporary popular music and the broader gospel vocal style, the specific terminology used to describe them lacks precise definition, and also highlights the failure of conventional notation in successfully capturing or representing them. 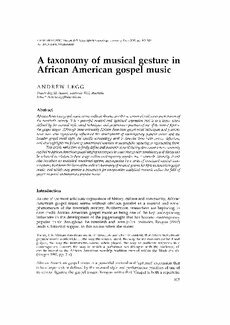 This article seeks then to firstly define and annotate some of the key descriptive terms commonly applied to African American gospel singing techniques in order that greater consistency and clarity can be achieved in relation to their usage within contemporary popular music research. Secondly, it will also introduce an analytical notational system, accompanied by a series of annotated musical transcriptions, that forms the basis of the author’s taxonomy of musical gesture for African American gospel music, and which may provide a framework for comparative analytical research within the field of gospel-inspired contemporary popular music.